Arrow-Roxithromycin (Roxithromycin) is an antibiotic used in the treatment of respiratory tract infections, soft tissue infections, and urinary tract infections. Manufacturer : Arrow Pharmaceuticals Ltd.
Arrow-Roxithromycin (Roxithromycin) is an antibiotic used in the treatment of respiratory tract infections, soft tissue infections, and urinary tract infections. It is proven to alleviate the symptoms by preventing the growth of bacteria which causes the infections by. It does this by interfering with their protein synthesis. 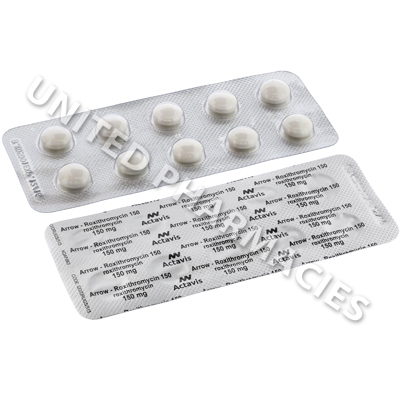 Arrow-Roxithromycin (Roxithromycin) tablets should be swallowed whole, without chewing, splitting, dissolving in liquid, or crushing. Unless otherwise instructed, dosing can usually be done either on an empty stomach or alongside a male or snack. The correct dosage for patients taking this medication varies depending on the severity of the condition being treated, as well as the patient's medical history. Never alter your prescribed dosage. There are also less common side effects associated with this drug such as dizziness, alterations in smell and taste and abnormal liver functions. If any of these side effects persist or worsen, you should consult your doctor immediately. Always use Arrow-Roxithromycin (Roxithromycin) as you have been prescribed by your doctor. Never self-medicate or change your dosage without first consulting your doctor. The correct dosage can vary depending on your health, medical history, and the severity of the condition being treated.